We read “Foul: The Connie Hawkins Story” and “A Sense of Where You Are.” We worshiped the Knicks’ Irish enforcer, Mike Riordan (#6). We wore the same tattered and stained uniform on the court every day: ripped t-shirt, sagging shorts, drooping socks in a nod to Pistol Pete, and sneakers that were little more than canvas threads wrapped around our frostbitten feet solely (pun intended) for the purpose of holding the carefully folded newspaper that lined our decimated insoles in inclement weather. We swore and threw elbows at each other when on opposing sides, forgetting all that when teamed together. And when the games were over we reminded each other to swish one before leaving the court, waiting until everyone complied. We had high standards there, even a hint of rim and the shot was denied. There were some playful jabs thrown, some eyes rolled at those times when someone was cold. But we waited. Then we went home to our individual stories and we thought about basketball and friendship. We never walked off a court without ‘swishing’ our last shot. We just didn’t. There wasn’t a written rule here, no concocted mythos where dire consequences were the outcome for our failure to do so. It was part ritual among friends, part an ambiguous gesture of reverence for the game, part good form; a ‘thanks’, if you will, to the basketball gods or to whatever the elusive source of our good fortune for being given the opportunity to play. To leave on a swish was to leave in good standing on the most poetic element of the game: the musical ‘thwop’ of ball through net, the lively jig of said net as the ball exits, the mathematical perfection of the shot itself. To leave ‘un-swished’, as it were, was sloppy and inconsiderate, a low class exit undeserving of us. We were raised better. We all had a play or two that we carried with us through the years: maybe a ‘no-look’ pass delivered as one of us slashed directly under the basket along the baseline and pushed a tight two handed one-bouncer diagonally behind and through the trailing defender’s legs straight into the hands of a teammate who would be coming in at a hard angle from the top of the key. He laid it in lefty as the opposing players shook their heads and shrugged a what are you gonna do?’ look at the guy we smoked. We would throw a subtle nod to each other, our eyes meeting for a brief second in acknowledgement of what just happened before we both slipped back into the flow of play. Was there ever a time together we enjoyed more? Were we ever more in harmony with the universe? The game gave us that moment and others like it to contemplate all these years since. It bolstered us through things that were not as pleasant off the court. Before leaving we swished our last shot in homage to it and to the cosmos and each other. We are awash in swishes today. They are raining down upon us. There are more attempted, more made. They are expected, taken for granted. They have been commoditized. Their beauty is still there but they are not as magical. They still excite but they do not awe. So ho hum. It is not uncommon for someone on a three-on-one fast break for the offense to forego the easy two on an uncontested lay-in and pull up for a three. They don’t aim for the rectangle – bank shots are now considered a lucky break on an errant shot – they pulled up for the swish. There was a time when they occurred far less frequently and when they did everyone on the court would whistle ‘swishhhhhhhh’. Someone out there would croon like a play-by -play announcer: “nothing but net!” We would pause to admire it. We would make a note that there was a sharp shooter on the court. I don’t bemoan this, I think, though I do feel a tinge of sadness that a thing of such beauty is so commonplace now. 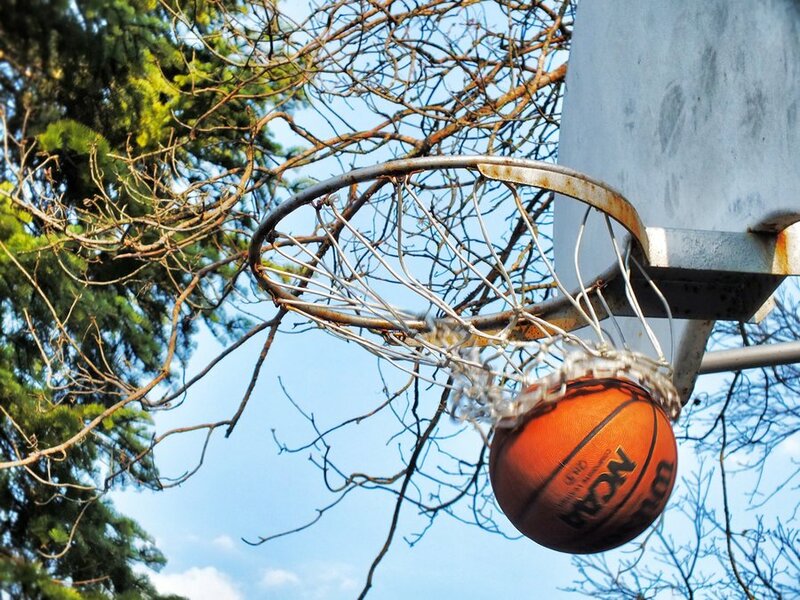 Really, is there a more delicious moment in sport than the spectacle of a basketball floating in a towering arc off a shooter’s fingertips and dropping through – and untouched by – a metal cylindrical rim? Choose your sport and choose your moments. This is a discussion meant to be had in your local brew-pub over a cold one with good friends of like mind; friends who, like you and me, relish arguing the little things made big in sports, in literature, in music – in art for God’s sake! – in love and in friendship; friends who would never let you leave a court without a swish. For me that was Brian and Steve and assorted guests as we sat huddled and emphatic over our pints of Hammerhead Ale in the sunny courtyard of the Fulton Brewpub nestled close to Willamette River on the southernmost border of Portland, Oregon. Our conversations would focus on the magic of sport we experienced on the playground. No uniforms, no teams, no set plays, no schedule. Just a bunch of rag tag kids with our whole lives before us who met after school to play a game we loved. We are scattered now. Some have died, Brian among them, and I scratch my head because I feel like I am still fourteen years old, playing hard with my buddies, drinking our post game Slurpees with our bikes scattered over the sidewalk. We knew who was going home to warmth and joy and we knew who was going home to something other than that. I am so full of thankfulness for those days. For some of us, it was all we had. We swished that last shot for unknown reasons then. But it is so much clearer to me now. We swished those shots as a prayer to get us through. And for those of you out there then, can I just say thank you for being there and for loving the game and waiting for me to swish one? Reach Joe McAvoy at jmmcavoy@gmail.com.